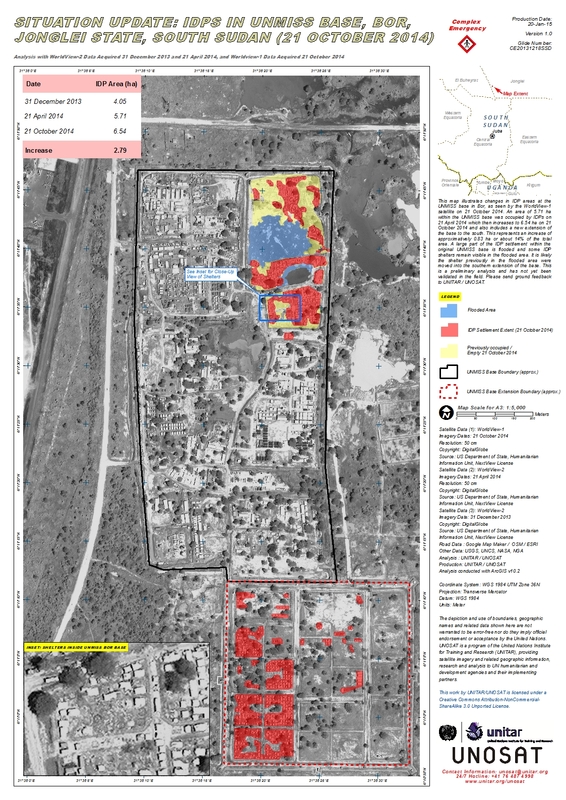 This map illustrates changes in IDP areas at the UNMISS base in Bor, as seen by the WorldView-1 satellite on 21 October 2014. An area of 5.71 ha within the UNMISS base was occupied by IDPs on 21 April 2014 which then increases to 6.54 ha on 21 October 2014 and also includes a new extension of the base to the south. This represents an increase of approximatively 0.83 ha or about 14% of the total area. A large part of the IDP settlement within the original UNMISS base is flooded and some IDP shelters remain visible in the flooded area. It is likely the shelter previously in the flooded area were moved into the southern extension of the base. This is a preliminary analysis and has not yet been validated in the field. Please send ground feedback to UNITAR / UNOSAT.